Do you want to do something different? How about going on a fishing excursion on the Zambezi River. With more than 75 species in these waters, this is one of the most exciting and challenging experiences for avid anglers: an opportunity to catch the Tiger Fish. It is rated by many anglers as the finest freshwater fighting fish in the world. Lake Tanganyika offers some of the best freshwater angling to be found anywhere on earth. More than a dozen species are regularly caught on rod and line. With basic fishing tackle for hire or purchase, a good catch is virtually unavoidable! Different techniques suit varying conditions, time and species. 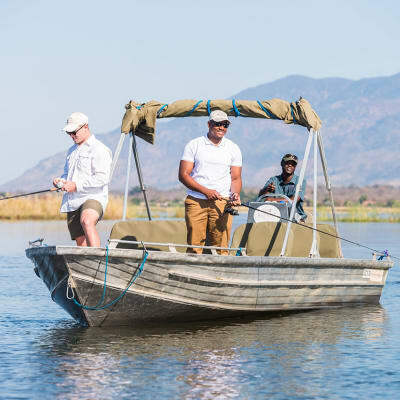 At the Royal Zambezi Lodge expert guides lead fishing excursions on new, fully-fitted aluminium boats. Guests new to fishing or fly fishing have the chance to receive instruction and assistance. Rods, tackle and flies are provided although fishing enthusiasts are welcome to bring their own. All fishing is on a catch and release basis. This is a double dose adrenalin trip, you experience the best rafting on the planet, and catch the greatest fighter by weight, the notorious tiger fish. Tiger fish is arguably the best sport fishing species in the world. For an experience of a lifetime, join Bundu Adventures on a six day fishing trip all the way down to Lake Kariba! 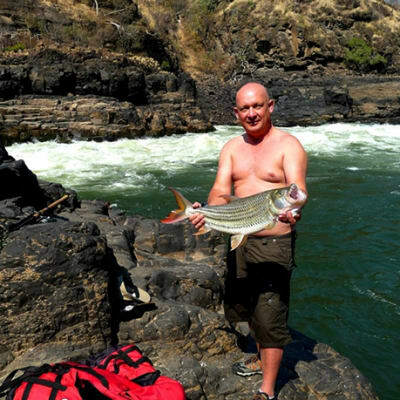 Fishing for Tiger Fish is one of the seasonal specialties of the Zambezi River. Although Tiger Fish and other species can be caught throughout their safari season, the best time to catch Tiger Fish is from late August to mid November during the hotter months of the year. The waters that surround Mvuu Lodge Zambia are the perfect habitat for many species of fish such as Tiger fish, Bream, chessa, Nkupi, and the legendary Vundu, making this a fishing haven. Experienced guides accompany guests on all fishing expeditions, assuring guests of great opportunities to catch trophy fish. 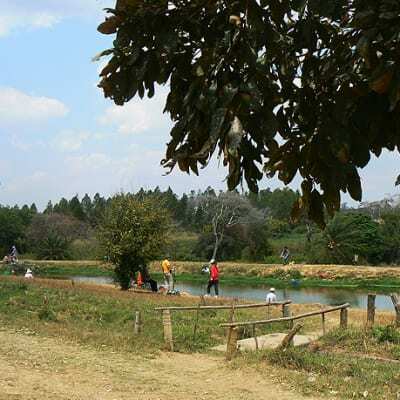 One of the most popular activities at Kalimba Reptile Park is a full day of fishing in the ponds that are open to the public. Visitors can hire basic bamboo stick rods and bait, and then braai (bbq) their catch for a picnic in the park. Individuals and groups are more than welcome to fish all year round. Whatever kind of fisherman you are, Nsofu have the bait to get you fishing. 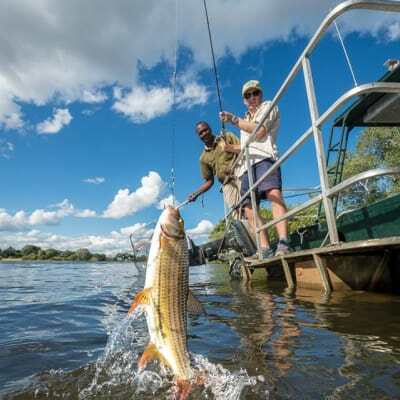 The Zambezi and Kafue is a paradise for any adventurous angler, whether a conventional, lure or fly fisher, you are up against tiger fish, bream, vundu, nkupi, catfish, and African pike. Nsofu does river transfers from hotel to hotel or lodge to lodge using their boats. Lake kariba has a number of fish species like tiger fish, Kariba bream, barbel, tilapia, vundu, barbel, chesa, bottlenose and many more. 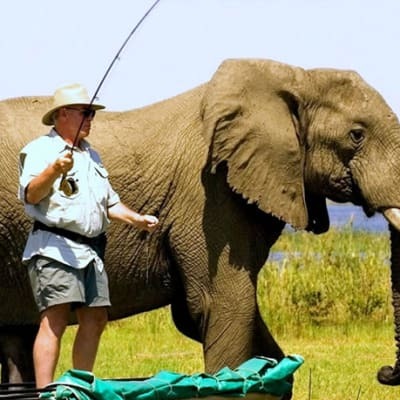 Lake Safari Lodge specialises in Tiger fishing and sport fishing. It provides a quality fishing experience for individuals, groups, families, and corporate outings. Potato Bush Camp has expert fishing guides and a range of boats to perfectly suit the real fishing enthusiast. The camp supplies all fishing euipment, but for enthusiasts who prefer their own equipment. The tackle and technique for tigerfish has been described as very similar to that of 'bone-fishing'. The Zambezi River is host to some of the most spectacular fresh water sport fishing in the world with plentiful Tigerfish and Tilapia. The most sporting and certainly the most fun fish to catch is the famous Tigerfish renowned for their strength and spectacular 'leaping out of the water' fighting performance. On the Chambeshi River of north eastern Zambia is the most remote head stream of the Congo River and therefore considered its source. Through the vast labyrinth of waterways is a fisherman's paradise for Hydrocynus Vittatus, tiger fish, famous for their ferocity when hunting. Or you may prefer a trip to Lake Tanganyika for perch as well. Matoya Fishing Lodge offers fresh water game fishing experience to the adventurous anglers. The worlds - renowned extreme fighting tiger fish, is indigenous to the fresh waterways of the Barotse floodplains of the upper zambezi. Large bream and trophy-sized tiger fish are plentiful as well as other species. 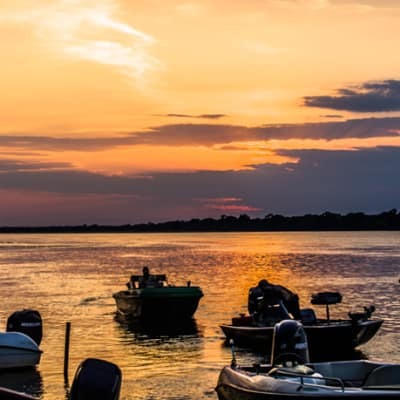 With over 75 species in these waters, you can't go wrong with a fishing excursion on the Zambezi River. It offers one of the most exciting and challenging experiences for avid anglers: an opportunity to catch the tiger fish, rated by many sports anglers as the finest freshwater fighting fish in the world, a powerful swift predator. Sekoma Island Lodge is an excellent destination for the adventurous angler. Guests can catch large tilapia, various bream species, catfish and African pike. With a fleet of eight boats which are powered by 55hp motors the boats accommodate a maximum of two fly fishermen or four lure anglers at one time. Fly-fishing and lure fishing are predominant fishing methods used. The lesser-visited backwaters can be explored where many of the vegetarian species of bream such as the Greenhead Tilapia and Pink Happies call home. Tiger fish are caught predominantly by fly fishing and artificial lure fishing, during April however, the river is high and discoloured, some bait fishing using circle hooks is allowed. Shackletons Tiger Fishing Lodge is located on the mighty upper Zambezi River near a village called Mwandi. This is an ideal venue for fly fishing, spin and lure anglers of all levels to fish in a perfect habitat of the fierce tigerfish. The lodge has a team of highly experienced guides that accompany you fishing voracious tiger fish on the river. Tiger fishing on the Zambezi River, Zambia is legendary with Angle Zambia's fishing boat charters make an exciting fishing safari. 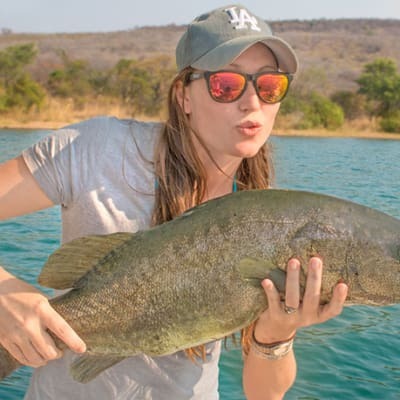 Right in the middle of the exciting tourist town of Livingstone there is enjoyment to be had by all – the serious angler, recreational fisherman or the first timer. This Angle Zambia camp offers an excellent fishing safari in Zambia. 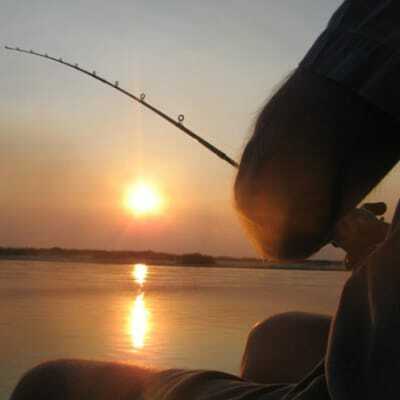 Here you can experience the thrill of a truly unique and exhilarating fishing experience on the Zambezi River. Angle Zambia offers some of the best charter fishing trips available in Zambia. Anabezi Luxury Tented Camp in the Lower Zambezi National Park, Zambia. It is perhaps best known for its exceptional fishing safaris on the Zambezi River. 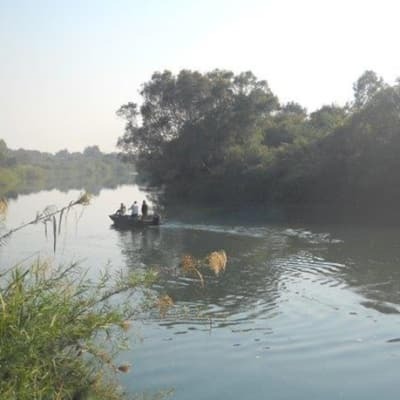 The river and its channels carry an excellent variety of fish including the acclaimed tiger fish which is rated as the toughest pound-for-pound fresh water fish in the world. On these wonderful trips you'll be able to move around the lake islands to appreciate the abundance of wildlife. Half and full day fishing trips are available with rods, tackle and a packed meal supplied. Apart from the tiger fish, you stand a chance of catching various species of tilapia, catfish and more.